One of the most common questions regarding soccer cleats resolves around actual fit – with wide footed players often finding it more difficult to find a match for their feet. To make things a little easier, I thought it would be a good idea to create a break down guide with options for what are currently the best options on the market for wide footed players. The following is a list of suggestions based off of my experience. It is important to keep in mind that not all players will have the same experience with a cleat, but the following “Best of” guide should be a useful starting point! The concept of picking a light weight soccer cleat that will fit a wide foot is often very daunting and players will turn away from the category. But, having just tested the adidas adiZero Prime, I can tell you that wide footed players do have an option! They offer what I would deem to be a medium fit to start, but the adiLite single layer upper does have some give. At 5.2oz, there is no better option! Another option worth checking out is the Nike Vapor VI range, while on the other side of the spectrum avoid the Puma V1.10 SL that fits very small. In my opinion, the Under Armour Dominate is one of the least appreciated soccer cleats on the market, especially when it comes to comfort! In testing, I found they performed really well and offered a very comfortable fit. For players with a wide fit, there probably is not a better option on the market. And don’t be fooled by the fact they are made by Under Armour – UA are a dominant force in both baseball and football, so they know how to create a boot that matches the requirements of top flight athletes. 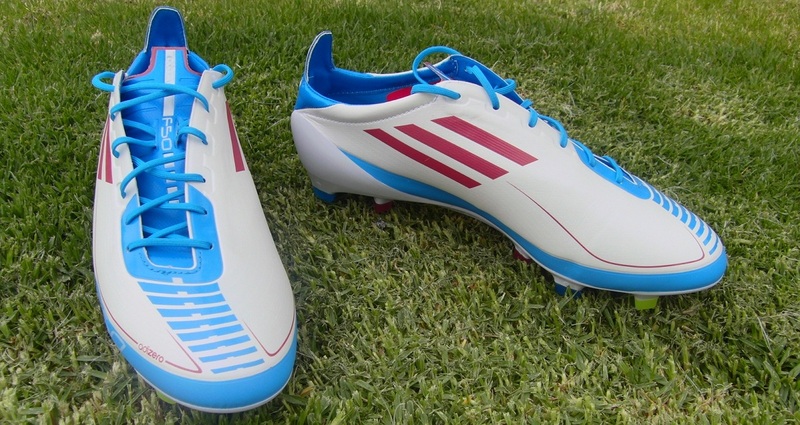 Another great option worth checking out is the Adidas Predator X. This is one of the more complex categories that offers the largest selection. The Nike T90 series has always be renowned for offering a wide fit. And even though the T90 Laser III offer a redesigned fit with off center lacing, they still offer a very suitable fit for those players who need some extra room. When it comes to power, the T90 Laser III has the right technology to match the best strikes in the game. The highlight of course are the five pods that sit along the strike zone, designed to distribute pressure on impact with the ball – there is no disputing the T90 Laser III falls into the power category. The next best option is the Adidas Predator X. When it comes to a straight forward leather soccer cleat that suits a wide fit, look no further than the Pele Sports 1970. These boots have not been on the market very long, but they are built with with class. I would recommend ordering down a half size to ensure you are getting the right fit. When I reviewed them, I had to include a full section dedicated to the leather used on the 1970, the entire upper of the 1970′s is a one-piece kangaroo leather that has undergone an incredible 150 separate processing steps before it is ready for use. Notable mentions that are always mentioned in this category include the trusty Nike Tiempo Legend and the Adidas adiPure IV, although I have to admit that during testing I found the Tiempo Legend fit small. Once you actually get your foot into the Lotto Zhero Gravity Ultra, you will find a surprisingly suitable wide fitting boot! What better way to treat your feet than have them in the most advanced laceless soccer cleat on the market. 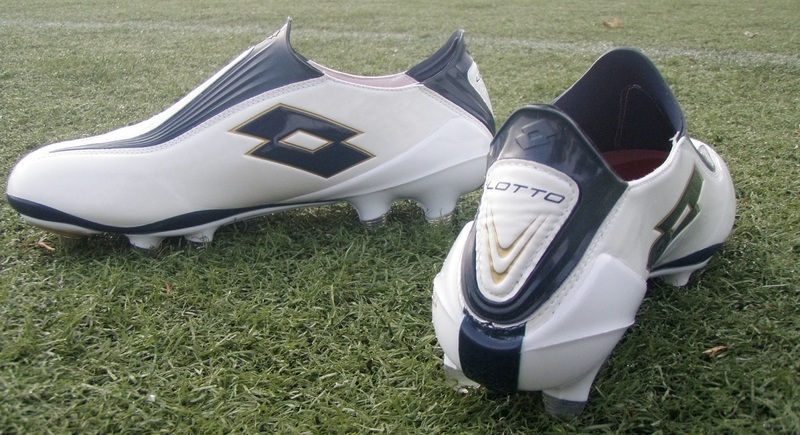 Add to that the pretty tasty designs that Lotto use on the range and they are pretty top class boot. I had some reservations during testing and actually found them to be a little loose for my foot – getting the right size is paramount to ensuring you can get the most out of these come game time! Again, I need to point out that these are suggestions based off of my experience – not all players will have the same experience with a cleat but this is about the best guide you are going to get! To find the best fitting boot you should always try a pair on before buying. Has anyone ever ordered the wide-fit cleats on NikeID? I also want to know about this. Some of the boots come in "Advanced fit" if they have a HG stud option. However, I am not sure if the Advanced fit is wider than the "Wide-Fit" or not. I know I'm coming in very late here, but, yes, I bought a pair 11 months ago. They are def. wide. It took some time for them to stretch, but now the width is great. I wear a 4E, but they initially felt more like a 2E. One thing I would suggest are inserts. The thin cushoning in the sole is pathetic, and I replaced them almost immediately. I would def. reccommend them. They are pricey, but for me I wear cleats for a long time so it was worth the investment. "It is important to keep in mind that all players will have the same experience with a cleat, "
I think there's supposed to be a "not" in there. Good post though! Ok. Adidas and Nike boots are NEVER wide cleats. How can you possibly claim the adizeros are wide? My physio had to prescribe me with wide boots and the official recommendation was Asics. The physio did not even want to hear about adidas or Nike because they are too narrow and do not look after feet or ankles. If Pele are anything like the Nomis fit, then you are sorely mistaken. They are also very narrow! There is no way you have a wide foot otherwise you would not post these recommendations. You must have an average fitting foot. Lotto have more room in the toe box and are made big. So that one tends to be suitable for wider feet. I have one foot slightly bigger than the other (no joke) so I am always trying every brand out there. I usually find the left boot fits perfect but then the right is too tight. I have to agree with this. However, there are "wide-fit" versions of their boots, but they are unfortunately very hard to find. Regardless, even if a boot has kangaroo leather, this is still not suitable for wide feet because the sole plate doesn't stretch. And when I have my foot significantly overlapping the soleplate, I get foot cramps and blisters. Bryan, when reviewing a boot I would suggest that if there is an extra inch of lateral space in the boot, THEN it is a wide fit. Just because their is some stretch in the upper does not mean the boot is suitable. Possible ACTUAL wide-fit boots that I know of are things like the Adidas F50.6/7 Tunit WF, the Mi Adidas Predator X WF, the NikeID Mercurial Miracle II WF, NikeID Tiempo Legend III WF, Nike Laser III WF or the Joma Aguila WF. Frankly, I don't think any of the boots you've suggested offer a wide-fit. I think you have them confused with medium fit. Just because they are not narrow does not mean they are wide. I.e., these are more like D width boots, whereas a wide fit boot should be at least an E or higher. Agreed. The WF version of those boots are rare and I sometimes see them in stores. They are clearly labelled on the box. However, the ones I saw were usually the lower version of cleats and not the top of the range. The widest boot I have ever tried and own are my Andreas. They are like Copas but wider and softer leather. They are hand made in Italy. They are hard to find though. If you want to get a high end wide version of a boot, try the NikeID or MiAdidas websites. They are more expensive that some online retailers, since you are paying the full RRP, and I don't think they ship internationally. From the website, you can get the Nike Tiempo, Laser III and Mercurial Miracle II in wide fit. The Adidas website only seems to offer the Predator X in wide. However, if you go into an Adidas store they offer the MiAdidas feature and may be able to get other wide fit boots for you. I live in Australia so no chance of that unfortunately. I live in Australia also. There are several ways you can go about it. There are Adidas stores in Sydney and Melbourne, and possibly other places. They should at the very least be able to get you Predator X's in wide fit. Otherwise, you can use a parcel forwarding company like Bongo International, who will ship it to you. Or there are some people in Australia that do it for you, but you'll have to pay about an extra $100. I think one guys site is called "MyNikeID". Will cost about $300 or so for wide fit. Brook – I can assure you that I have tested every one of the boots on the list so I can give a pretty accurate break down of what is suitable and how they fit! To state that none of the boots on the list offer a wide-fit shows a lack of knowledge on the subject! It is very easy to suggest WF boots – how easy would it be to write a post on that?? The above list are suggested options by category for people looking for a "tested" option. Bryan, I think you misunderstand. While I appreciate the fact that you have indeed tested all of these boots, and that you state that these are the widest boots you have tested, I still do not agree that these boots are in fact wide. I can't say that that none of them offer a wide fit, but I know for a fact that the T90 Laser III's and the F50 Adizero's do not, since I own them myself and they are my regular playing boots. But I play in them knowing full well that they are not wide enough for me, and certainly not wide enough for people with really wide feet. The sizing range for shoe width goes: A, B, C, D, E, EE, EEE, EEEE, F and G.
Mainstream Nike and Adidas boots are all sold as a size D, while I am more in the E-EE range. Granted, there is some variation in the widths of their boots, but you wouldn't recommend your US size 9 boot to someone who needs a size 13, just because the boot fits a little long. And when a person needs a EE or greater width boot, then the boots recommended here wont cut it. Even the custom wide-fit boots from Adidas and Nike are only a size E.
I don't mean any disrespect. it is good that you have recommended the widest mainstream boots, but this is obviously going to be a controversial subject when it comes to helping people that actually have significantly wide feet. Essentially, people's options are going to be WF versions of mainstream boots, which are a size E. If there feet are wider than that, brands like Asics do sell their boots by width as well, and you are able to get EE, EEE, etc, sized boots. Of course, most people want the flashy ones though. "Even the custom wide-fit boots from Adidas and Nike are only a size E. "
Fairly sure it is. I know the Adidas Tunit 50.6/7 WF were listed as size E, so I presume that is the case. Probably a slightly wider E though. I called Nike customer service and that's what they told me, too. We order Tiempos Legend IV wide and they still arent wide enough for my 11 year old boy. He is going to need a 2EE. im a size 2E in new balance and my right foo! is bigger than my left. ive had adidas f50s size 11 and they werent too bad for my left- but my right had blisters and bruises under my toenails. im going to try those sites brook mentioned, maybe a size 11 1/2 2E/wf maybe even a half size on my left! thanks to brook for the info! The F50's and the T90' are FAR from wide fitting. You must have a VERY narrow foot. I'd hate for someone to take your advice and order online to only find that the F50's are one of the more NARROW fitting boots. I also agree with what you said. I have had just about every boot made by nike and adidas and even the ctr360's that are suppose to be wider are not any wider then the total 90's. There is not one boot in this review that is any good for wide feet. Especially the adidas's. If your feet are even the slightest bit wider then normal then any adidas boots will hurt very bad and get blisters where the upper and soleplate meet. If you have wide feet you should look at pumas. The have a really wide soleplate even if there not ordered in a wide. The powercat 1.12's are extremely comfortable for wide feet or even just as a soccer cleat. Along with that they have the best touch of any boot out there. I think the touch is even better then the tiempos plus they have the 3D striking pad which gives the ball a surprising bit of pop and power when you strike the ball. I have the same problem. My right foot feels tight while my left fits perfect. My right foot is also a hlf inch bigger than my left. So i always try differnt cleats. I got a pair of Joma Cordoba cleats for the upcoming season. I've used them a couple times so far and have got say they are the best cleats i have ever had. They are comfortable and fit just right. The only thing is you should relac them. This is the problem with corporate shoe manufacturers now. They don't want to account for the fact that there are people with wide feet, or combination feet like you just suggested about yourself. It's ridiculous. When we made our shoes in the US, we could get accommodated for all these things. Now……it's nearly a far memory. We all need to demand better of these shoe companies, it's totally ludicrous that we constantly struggle to find footwear when there are more of us not being considered than are. I'd say the Nike Maestri's are good for my wide feet. The soleplate is wide enough and there are no pressure points on either side of my feet. Well thats great but that is because you don't actually have wide feet. Try asking some of the Samoans on my team what they think of trying to squeeze their monster wide foot into CTRs. Seconded. I tried CTR 360's because of all the hype. Found them to be narrower than the Tiempo's. Took quite a struggle just to get them on. Initially they didn't feel that bad…until I tried to stand up. The studs were quite painful on the ball of my foot. No idea why people would recommend them to wide-footers. Probably the narrowest Nike boots I have tried. A shame though because I did want to try them in a game considering the hype. I realize its most of the brands for except Puma and I'm about to buy PUMA's so I'm sort of lost. I'm also more of an attacking midfielder. Yeah Puma's tend to fit smaller Carlos – best option is to try on a pair if you can before buying! All makers of shoes used to make a variety of shoes which cater for all kind of feet and Puma used to make them wide (6 or 7 years ago) which fit me perfectly , i have fairly wide feet so i know . These days the only boots that seems to accommodate for wide foot are Asics (very very comfortable shoes and well made just not a big fan of the Heel Gradient 10 mm) and some Diadora's. Why dont you try the Andreas like Mike mentioned above? So has anyone worn a pair of cleats and then ordered the same cleats via NikeID in the wide-fit? I want to know how much wider they actually are. I found Predators to be the narrowest for my foot. I have a shallow arch and if you look at the sole of Predators, they look like coke bottles – narrow in the middle. Hence they really squeeze my feet at the middle. For me, they were the most uncomfortable boots I've ever tried on. I found that with each progression of Adipures, they seemed to have gotten wider. Yeah, I checked out Predator X's the other day. Just looked at it from the bottom and thought "GOD NO!". Was the the most narrow soled shoe I have ever seen. Couldn't believe people say it is one of the widest available. I thought this also in regards to the Adicore range, which is similarly narrow in the arch. but after i stretched the leather to fit, i realized that it was designed this way on purpose, for it seems to fit a normal to high arched foot quite well. I have a size E width and was surprised that it was quite comfortable. I could be an exception to the norm? Perhaps the arch of the foot shouldnt necesarrily be making too much contact with the field, and this sole design may in fact contribute to more flexibilty and better manueverability while running during the game, at least in my experience. I should also point out that the Predator I tried on had a very prominent and stiff area around the "toungue," or lack thereof, which squeezed the circulation from my foot and was quite uncomfortable. So if you have a prominent top foot, this may also be a concern. I have wide feet and have always worn Copas. They always end up busting out on the inside, but it's the best I've found. Very comfy, and don't FEEL too narrow. I'm about to get a new pair and am thinking of trying the Puma Kings…just nervous about wearing something new when I've worn Copas for 15 years now! Ive had success with Umbro Specialis, the TF and HG versions, not the Statement version, which was shorter and more pinched in the toebox. I have a size E width, and found them to be a better fit than most boots Ive tried on, including the T90's. Hey bryan,would u recommend adipure iv for wide feet? I have size E width and I do fine. As per my previous post here, I also have shallow arch which requires the sole to be wider for a comfortable fit. While the Adipures may not have a wide outsole, their high-quality leather will mold to your feet and I have not had problems with Adipures (or Copas for that reason). I have a rather wide foot, E width, so I thought I would list some other boots I had success with. I often wonder why boots dont come in more widths as other shoes do. In any case, the PUMA King Classic Top DI FG is one of the best, if not the best for my wide feet. K Leather, 1/2 size large, order down. The boot runs high up the top of the foot, and also has a higher heel profile than any other boot. And its all black! I also had success with an Adicore, the first release, but it took some time to stretch it out before I wore it in a game. Soaked in water, wore around the house, used cedar shoehorns, not without discomfort. But in the end it strechted to fit. One other option was the Umbro Speciali which was an immediate fit straight out of the box in both turf and HG varieties. Gorf, i have these and they fit like gloves but the new Pumas are for narrower foot. I would think that a k-leather boot would be the best for wide feet. Wouldn't it stretch the best to accomodate? K-leather definitely allows for a better fit, as you know that it will stretch over time. The only negative is sometimes it takes several training sessions to break them in. Synthetic boots are generally created to be a little wider before you wear them, but the negative is they won't stretch – so, size will vary according to the pair! i was surprised when I first tried on the adizero, not only because of it's lightness, but also my foot actually went in it because with vapors, I can't even put in my foot. FYI, my feet are so wide, it couldn't get them in the T90 II's, which a]re considered a "wider" cleat. As a person who has an extremely wide 9 EE foot. I would definitely suggest the Total 90 Laser series and Under Armour Dominate as an everyday boot. Surprisingly like Bryan said the Adizeros fit a wide foot. Don't ask me how. But my duck feet actually fit. Now don't get me wrong it wasn't extremely comfy, but I don't know of a speed boot that is and wide at the same time. And yes Kangaroo will stretch to accomodate a wide foot, however, shoes like the copa and adipure that don't have a wide last aren't ideal. If I were to wear copas. I would have 2-3 of my toes hanging off the side of the shoe after I stretched them out. Thats no way to wear shoes. Growing up I would wear narrower shoes and i would get cramps in my calves and my feet were tired from constantly being in the wrong position as I ran. These days I order shoes from Japan. Mostly similar to No. American releases just with different soles/last to accomodate duck feet. Its been a joy to run around in them. Too bad I didnt know this when I was younger.. I can vouch for the UnderArmour boot. Super comfortable. The insole is the best of any athletic shoe I have ever worn. I wish all shoes used their insoles. However, durability was an issue. It began to tear along the sides and then someone step on me from behind and the entire shoe ripped in half to the sole. No kidding. I would try them again though. Soccer.com returned them so no big deal. I will also recommend the Diadora Maracana RTX 12. This boot is awesome and a great deal. Not quite as comfortable but much better feel on the ball than the UnderArmour. The only problem I am having with these is that the tongue on the right shoe is starting to separate. Another issue, only asthetic, is that the diadora logo on the sides has ripped partially off on both shoes. I definitely agree with the Copa point in particular! I spoke with Mizuno recently Eric and they mentioned that the boots made in Japan offer a completely different fit – so i think it is time I followed your advice and ordered a pair from there! When you say order shoes from Japan, what does that mean? Where do you do that? I have a larger/wide foot 12/13 EEE. I wear the Nike Tiempo Legends and they fit pretty well on my wide feet considering I didn't have to go up a size like I do with most other cleats. Man Bryan, you really sparked a pretty good discussion here. Well, we can tell by now that there's all kinds of wide! I have tried Nike's and the Tiempos are the more suitable ones. I tried the CTR once and they are definitely narrower. I do not agree with the T90's being wide enough. Vapors and Superfly's are so ridiculously narrow I could very well use them as clown shoes. The same goes with Predators. Even though Adidas has always fit me better, I still have to order at least a half size up. This is the case with the leather F50+ tunits, that had been the most comfortable so far, only to be beaten by the Adizeros!!! I did not see that coming! But those did mold to my feet. I still want to get some leather ones. It is length, rather than width that makes them too big. I have a medium/wide foot and really needed that half size smaller. They might work – but it is the synthetic used in the Prime's that set them apart! Does anyone know how well the adipure SLs accomodate a wide foot? are the f50 good enough for wide feet ? I am fifteen years old and I play footballl seriosly, so I want to give me advise… My foot is 26 cm long and 11 cm wide… (UK – 7.5) Are the new Messi boots good for me ? They offer a medium/wide fit so I would imagine they would fit you nicely. well, think again after looking my post, are you sure they will be good for me, maybe the f10 if I buy them … The new colour of Messi I mean ..
how about CTR maestri II? im interested on that shoes based on your review. i have saome problem with my wide feet. in adidas (adipure,adizerof50) i found 8.5 US is comfortable. But in nike (tiempo r10, mercurial) i try 8.5 US is too tight for my wide feet, but if i try 9 US its 0.5 cm too long. CTR360 Maestri II will work as a suitable option. I had the same experience with the adiPure/Tiempo ranges! CTR360 fit nicely. hey bryan, my main problem with finding wide fitting boots is not the upper constricting my foot. it's stud pressure, which lightweight boot do you think would give me the least amount of stud pressure? You are going to want something with plenty of studs so there is more surface area to absorb energy. My recommendation would be the Under Armour Dominate, or look at the Pele Sports 1970! Am not boasting about my story, but I have a very wide feet and last year, I took upon myself to seek out a pair of cleats for myself, because the beautiful game was not being too enjoyable with what I was wearing. Went through 12 top brands, and tried on dozens of shoes. The one thing I learned is K-leather in combination with wide feet shoes = lots of comfort. So @ #2, I have the Nike Legend III K- leather, THEY ARE SPECIFICALLY MADE FOR WIDE FEET. and boy, do they perform well on the field. @#1- remember how comfortable it is to sit on the softest leather couch ? well, the softest, most comfortable shoes which is equally as conforting on the pitch, and is a wonderful shoes for taking powerful shot is….ring the bells folks :)…The Umbro Valour SX—hands down the best pair of cleats for wide feet. Nick, Sounds like you've done some serious homework and I appreciate you sharing it. Can you tell me where you got that the Nike Legend III K-leather boots are made for wide feet. They sound perfect for me (size 9 EE), but I'm nervous about buying them online and having them be like all the other Nike and Adidas "wide" Ds. Bottom line is that I need a 4" wide last and the Nike and Adidas are less–much less in some cases. Thanks Nick. I just posted my dilemma, then read your solution. Question: I take it you can only get the custom Umbro Valour SX online. will nike mercurial vapor vi's fit a person with wide feet? The CTR360s are surprisingly wide and the Predators are not bad, but one of the best wide-fitting boots that I've had is what I wear right now: the Diadora LX-K Pro. I also had a pair of Mizuno Wave Shinkens a while back that were a heavenly fit. The Puma power cats are good wide shoe. They fit my feet perfectly at an E size width. Pretty good cleat all around. The best fitting “wide” boots (for me, a guy with an 11EE/EEE foot) were the boots from around the year 2000. Puma King Top DI (http://tinyurl.com/455cd44) These boots are not K-leather as stated in this auction. They are Pittards leather and were damn near waterproof! The yellow was a rare colorway back in 2000/01. I loved the pair I owned. Nike’s Air Zoom Total 90 (http://tinyurl.com/3qdt233) The origin of today’s t90 Laser line and a surprisingly wide fit. These boots were great except for the FG studs (they always found a way to get ripped to shreds even if you never walked on anything but grass). adidas Predator Precision (http://tinyurl.com/4y9rbtu) Another surprisingly wide fit. I had issues with the studs breaking off and the predator element ripping apart. Looked great but didn’t last long. adidas Accelerator (http://tinyurl.com/3kdlmgg) Definitely one of the best Predator boots ever made. It fit slightly wide (enough for me to love them but not as wide as other boots!) and looked great. Umbro Speciali (http://tinyurl.com/3mpz362) K-leather, best fitting boot I owned. I’ve never loved a pair of cleats as much as I did those boots. Such a great fit! As for modern boots, I have a pair of Puma King DI that I wear as well as a pair of the t90 Laser III (not as wide as I’d like but I can make do). I also just purchased a pair of the adipower Predators. With the leather forefoot, I’m assuming they’ll work well. Classic styled boots seem to fit better than the new ones. The only boot I could never wear that some “wide-footed” players swear by was a Copa. They were just too dang narrow. I wore a pair for a few months and within the first 4 days the stripes had cracked and started falling off the boots. Not for me. Can i ask which umbro speciali they are because the link doesnt seem to work? After doing a lot of online research and measuring my own shoes ranging from sizes 8-9 1/2 I have decided that if you have a wide foot then you better get a shoe made with a wide last( the foundation that the shoe is built on) or you will be hurting. You can try to get a size bigger but doing that actually will give you much more length than width and will really damage your running form. -First you must understand that feet come in many different shapes and what works for some may not work for you, you must try them on for yourself. Also there are many people that think a shoe is wide because it is has a lot of space in the upper, that is not wide it is just roomy there is a big difference. So Bryan you should call these shoes "roomy" or loose upper instead of wide because you can confuse people. -I have 2E feet and there is no shoe that can fit me when I wear a size 8.0, I have tried 9 and 9 1/2 but that leaves me with clown shoes and terrible ball control. I have tried maestris, lasers, tiempos, adipowers, adipures, v.111, copas, adizeros, maracana rtx etc. And maybe the tiempos and lasers were the best for me because of their soleplate is barely wider than the others. But they are still not WIDE and they hurt my feet bad. For example in my size 9 maracanas my little toe hangs off the soleplate and curls over it, and that is even after I got a full size bigger! -Nike offers wide fit but on their website it says it is a wide upper with the same narrow soleplate as the regular ones. Do not get this if you have wide feet. I believe Adidas does the same thing with their shoes but I am not sure. -So far I have only found two companies that make actual wide lasts, and they are NewBalance and Asics. NewBalance doesn't make soccer shoes but they have a football cleat that looks like it could be a good soccer shoe. It is the MF897LB or 897 for short. It has plastic conical studs and comes in a 2E size for 80$. Asics also has some soccer cleats in size 2E but they can be hard to find. Their new DS Light 5 does have a wide model available and I think it is 2E but it could be E. I have seen pictures of the wide model vs the regular one and the ds light 5 in wide fit definitely has a wider soleplate and upper. -Something to note: Professionals like Ibrahimovic and Messi get their soleplates made exactly for their feet. There are many professionals that wear size E or wider. So it is not uncommon for people to need wide shoes, yet nike and adidas seem to ignore that when making shoes for their customers. Imagine if shoe companies only made shoes in a size 9 and instead of length they offered 12 different widths. The people that wear a 9 would be happy and athletic but everyone else would be hurting. Great post, Victor – very well researched and some extremely useful info! Hey, thinking about getting either the tiempo's or asics ds 5 light wide. I like the arch support, zero drop from the heel as well as the wider soleplate from the asics. The thing i like about the tiempo's is the flexgroove in the soleplate at the front. i can't stand shoes that are rigid there, they feel like shoeboxes. The asics don't look to flexible up front, could you please tell me what your take on this is? The front is as flexible as Tiempo. In fact it as more toe room for comfort. I have to say the most comfortable cleats i have used are the Joma Cordoba. I'm looking for a reasonably priced youth soccer cleat in wide. I'd like to find something my son can wear from age 7 to 10 when he'll probably start to fit an adult size. Ideas? Thanks! I bought wide fit tiempo's on nike id after the boots in store being too narrow, they are a perfect fit and great boots. I just bought the Lotto Zhero Gravity Ultra FG (the same ones shown here). I have a wide foot. I tried them on and they are loose around the ankle when I take a step. This is probably because of the width of my foot. Did you notice this when you wore them? If so, did it become tighter around the ankle? I may return these and get the Nike Tiempo Mystic IV FG. The ankle lining won't tighten, primarily because it is a synthetic material. I did notice the same thing, and it is simply part of the laceless design. If it is causing a nuisance, I'd advise going for the Mystic's instead. My 8-year old son has very wide feet (skinny kid — wide feet! ), and we’ve never been able to find soccer cleats to fit him. He wears a boys size 4 XW. Any suggestions?? I personally use umbro dynamis and it looks like a small fit but it is very comfortable for my wide feet. Great post! Do you know if the same is true of these brands for KIDS ? My son has a wide foot, and it is hard to find shoes for him, nonetheless cleats! Thank you. I want to say THANKS to all of you. Thanks for the post and all the feedback/responses. My 14 yr. old has been struggling to find good cleats for a long time, and I feel empowered with lots of ideas/options that I’m optomistic that he doesn’t have to contanstly deal with sore feet and blisters. Thanks again everyone for taking the time to share! It seems that Nike and Adidas have done such a good marketing job that wide footed soccer players discuss their products at length trying desperately to make one of their shoes work. I was happy to see mention of Andreas and some other companies mentioned here. I was surprised to see Mizuno barely mentioned once in all of the comments, yet they come in 2E, 3E & 4E. I wear Asics DS Light 5s, but I think they’re E, so I’m thinking of trying Mizunos. Unfortunately, the new Asics DS Light X-Fly only comes in D per Asics customer support. That said, I’d love to hear from anyone who has tried MIZUNOS. Notably, Mizuno Supersonic Wave 2 and 3 are listed as the top selling shoes on http://www.widesoccercleats.net. So, it seems they should get some discussion here. MIZUNO is coming to USA 12/2/2013 BUT…..
"Mizuno USA does not have plans, at this time, to offer wide width options in our soccer boots." Brook, I instant messaged customer service at MiAdidas and the reply was that they do not make any shoes in narrow or wide sizes. I guess Adidas has decided that we will all be D like it or not. I also emailed Pele asking for 2E and 3E cleats, but no response, yet. From http://www.soccer.com: "Unfortunately, our shoes are not classified under EE or 3E sizes." SoccerCleats101, you mentioned above that it would be easy to write an article simply listing boots that come in 2E and 3E, would you mind writing one as a follow up to this hot topic? I have been looking for a soccer cleat that contain my beastly clod hoppers. I am the owner of 14 sized, 4E (extra wide), flat feet. I have blown out numerous Copa Mundials, since that is my bread and butter on the pitch for decades, and am finally looking to dig deeper in finding a suitable boot. I am sure there are others out there like me, so am open to any advice, suggestions, or comments. My foot width measures about 4.25" which is right between D and E for a size 11 foot. Maybe its the lack of arch and flat foot that makes me feel like my feet are wide. I've been out of soccer for a while and am not up to speed at all on boot technology/sizing. Anyone have any recommendations on a good boot for an attacking mid-fielder/forward playing in an over 40 men's league in the $100 range? Thanks in advance! Kelme is by far the best cleat for wide feet…Adidias and Nikes feel like sausage casings . kelmes are tru to size because they are built wider than any other cleat..nothing is close and the quality is outstanding.. Ultimately, will all cleats stretch with time and wear? I also wear a 4E. Leather definitely will, synthetic a little but you will never get a full size of stretch from the material. Who can help me. I have wide feet. I want to buy online athletics to play with my friends in mini soccer fields. Please who could send me some websites?